Domainate stake your claim, a photo by totemtoeren on Flickr. 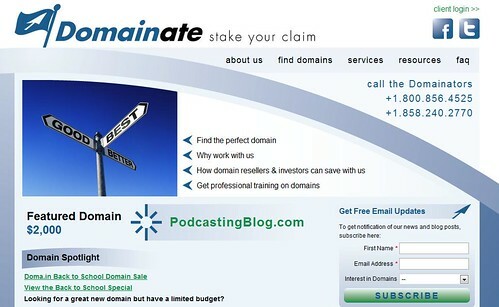 Domainate is a unique company in the domain industry. What differentiates us from other domain companies is that our focus is not just on selling our own domains, but on helping people navigate the waters and get the best domain for their needs. Domains are an integral piece of establishing and maintaining a strong online presence and from a cost perspective, it doesn’t take a fortune to get massive perpetual value in return. With a combined 22 years of experience in domains and over 15,000 domains sold, the leadership team at Domainate has thorough expertise on domains along with their value and potential. Our services cover a wide array of domain needs. We provide assistance in specific domain transactions (Acquisitions, Brokering and Domain Recovery) and finding the right domain (Brandingand Keyword Research) and we also offer Consulting to determine the best strategy for particular clients. Domains are the doorway to the internet and Domainate offers the key for businesses, organizations and individuals looking to stake their claim.